There’s a conversation going on in the grooming world, and it’s one our clients should be privy to. The topic? Doodles. And I’m talking labradoodles, goldendoodles, sheepadoodles, bernedoodles – anything that has been mixed with a standard (sometimes mini) poodle or already existing doodle. The truth is, the popularity of doodle dogs is on the rise but the education that potential owners are getting regarding their care and maintenance is dropping. This can be attributed to a few factors, ranging from a breeder spreading lies to sell a puppy, to a family so entranced by the cuteness of a fluffy puppy, they overlook the potential high maintenance of what they’re getting into. I want to address these issues and include the owners in the conversation that’s happening in grooming salons all over the globe because, as groomers, we are frustrated! We are frustrated because so often we have to shave doodles due to matting, and their owners are frustrated because they don’t know what they’re doing wrong and like their dogs fluffy, and in turn get upset with the groomers, who are upset with the breeders for not giving out proper information to the owners when they take home a puppy! This can really hurt the rapport between a groomer and their clients, something we’d all like to avoid. The big UNTRUTH I’d like to address about these dogs is that they are low maintenance. This could not be further from the truth. If you are getting a doodle, you need to expect and prepare for daily home maintenance. This includes brushing AND combing, every day. (With a slicker brush and metal greyhound comb). The end result should be the ability to get the comb from the root to tip of the hair. You always want to start with the slicker brush, as this will help break up any knots, and finish with the comb. Now, because doodles are not purebred (meaning they do not breed true, which is the characteristic of being able to predict and expect how the puppies will turn out) you may end up with a doodle that has a very thin and easily manageable coat, but you should always go in expecting the opposite. With all that being said, and this may seem counterintuitive, but what this routine should NOT include is baths at home. Without the proper tools, baths at home will only cause and expedite matting. Long coats need to be blow dried completely, and if they are towel dried and left to air dry and not brushed out, they will mat up. When you don’t use a comb and go all the way from the root to the tip, the top coat may seem mat-free while the root of the coat is completely matted. 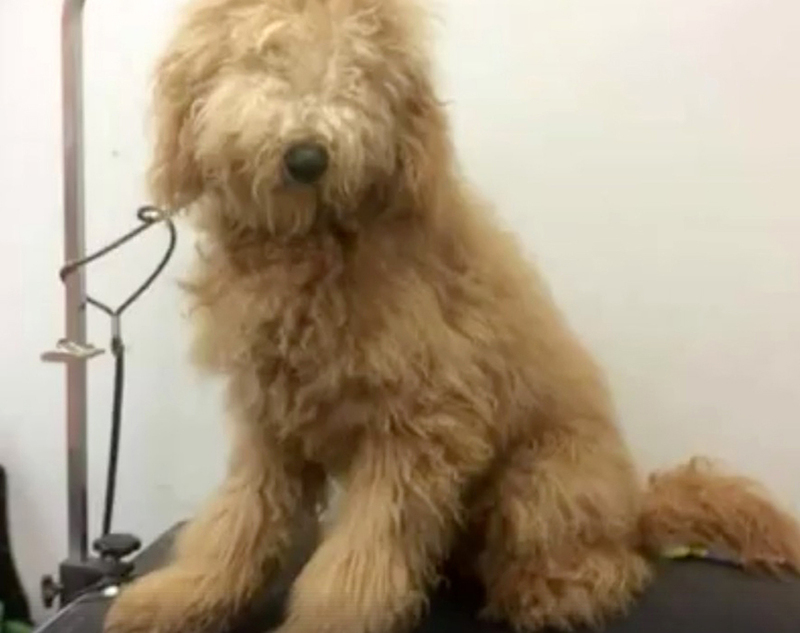 In addition, if you want your doodle to have that well-known long and fluffy coat, they should be at the groomer every 4-6 weeks. This is in addition to the daily home maintenance. Bringing them to the groomer will ensure they are clean and thoroughly brushed/combed. You can get them full haircuts or just trim ups – the possibilities are many if the coat is well-maintained. 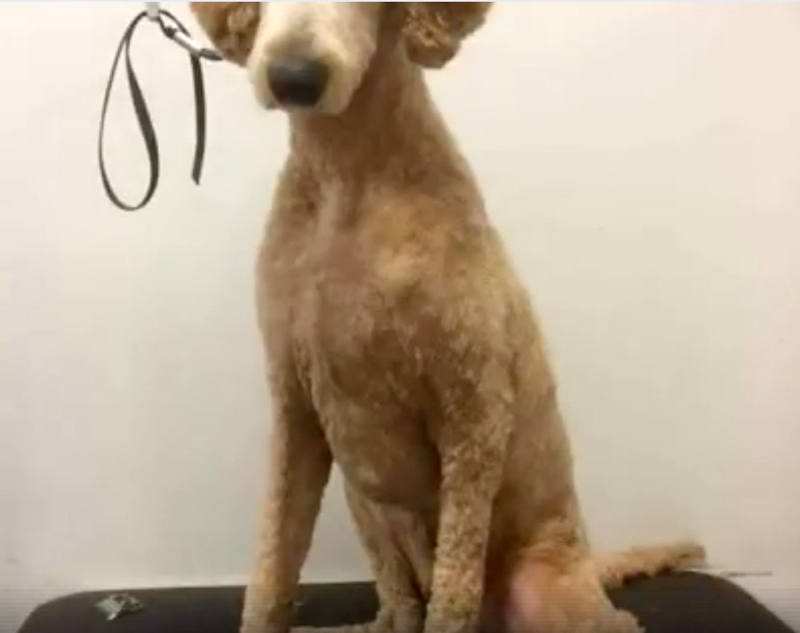 The cost of grooming a doodle is not small. That’s the plain and simple truth of it. Doodle baths/grooms can range anywhere from $50 to upwards of $200. There are many things factored into this price. The type of coat the dog has, the condition of the coat, his/her behavior during grooming, and the time spent on the service. Many groomers have a base price for the breed, but this price will increase based on all of these factors. The last thing I want to address is when breeders say doodles should not/do not need to be groomed before they are a year old. When this happens, their first groom is almost always a shavedown, right to the skin. Introducing grooming at an early age is imperative! Most groomers will have a puppy special of some sort, which is offered as early as 8 weeks. This will typically include nail clipping, ear cleaning, a bath, and a trim around their face, paws, and potty areas. If you don’t want your puppy to have a full haircut, you don’t have to! But you will still need to bring them in every 4-6 weeks both to get them acclimated to the grooming process and to keep them in the best shape possible. Their coat changes around six months of age and transitions from light, fluffy puppy hair to their adult coats. Their adult coats can have a variety of thicknesses and textures, but this transition can often lead to matting which is another reason to establish a regular home grooming routine and to see your groomer every 4-6 weeks. The last thing a groomer wants to do is disappoint their client, we want you to love the work we do as much as we love it! 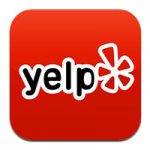 This is why it is crucial to be fully educated about the maintenance of the puppy you are getting, to find a groomer with great reviews and have a conversation with them, learn from them, and take your pooch to see them often! 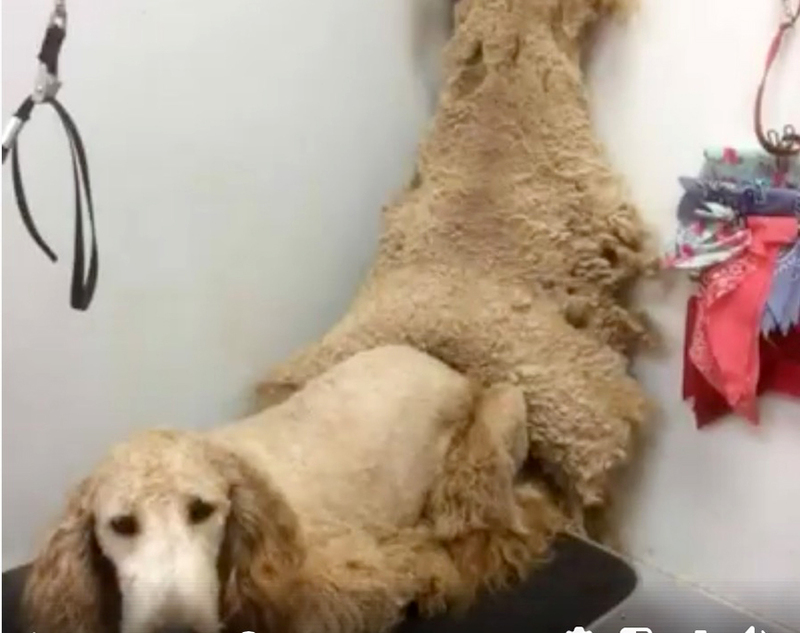 A doodle may not look matted, but as you can see in the above slideshow, their coats come off in complete sheets. It is DIRE to add, when dogs are in this shape, it is EXTREMELY painful for them. Quite often underneath the matting we find bruising, hematomas, skin infections, etc. There is no option other than shaving to the skin in those cases. Please note, this is fully avoidable with proper and regular maintenance! I am in no way saying you must or should keep your dogs in longer lengths. If your dog is active or you prefer them short for easy maintenance, there is absolutely nothing wrong with that. I am trying to avoid any animal from becoming so matted, they face severe skin problems and injuries. And trying to prevent heartbroken or angry owners from vilifying their groomer for shaving what can only be shaved. This information is not isolated to doodles! Any dog with a longer coat needs regular maintenance! Dogs with shorter coats that shed need maintenance! All dogs need their nails clipped/filed. Every breed and every dog has its own requirements, so please, do your research! ← What Language Does Your Dog Speak?